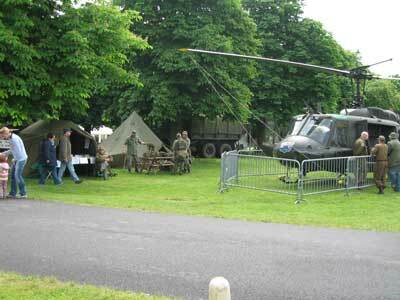 Thursday 22nd May 2008 saw the final preparations for the trip down to Beaulieu and the ‘Trucks and Troops Show'. Last minute supplies were sorted along with picking up the motorhome which was to act as our accommodation, stockroom, canteen and sleeping quarters! All the tents, Huey shop stock, generator and big screen TV were packed into the back of our second support vehicle to make the trip South. 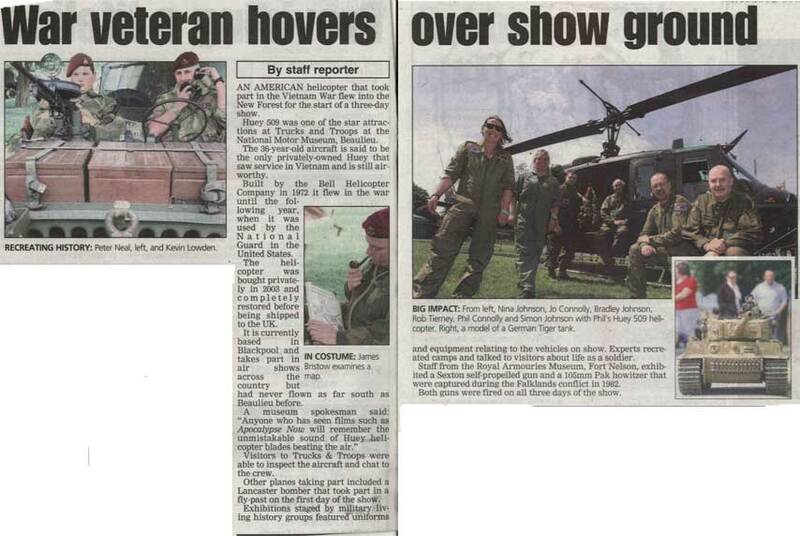 The plan was for Phil and Rob, along with Jo, to fly down to Thruxton. Nina and I would drive the motorhome and Bradley, the Navara. On our way south we were picking up Mark and Judith Howarth who were helping us out for the weekend. We were also to meet up with Lee and Neil who had been seconded for the weekend. The two vehicles set off at 6am Friday morning. Progress was good and we arrived at Birmingham around 9.30 a.m. missing the rush hour. As the morning progressed the weather was getting better the further south we went. Those flying down were aiming to lift around 11 o'clock. I put a call in to Phil to see how things were going and to report on the weather situation. When he rang back at 11.30 a.m. they still hadn't got 509 out of the hangar and on to the pad as they were waiting for a tow. We arrived a little after one o'clock, registered and were shown where 509 was to land and then the site where it was to be towed to. One or two negotiating points were sorted out regarding the area required to manoeuvre 60' of helicopter around! We got a call from Phil after 2 o'clock to say ‘509' had arrived at Thruxton and they were just sorting out getting it into a hangar for the night. Rob and Gwyn had kindly invited us all to dinner so we had our work cut out to set up the tents and drive up to the B&B where we were staying, not far from Thruxton. After a very picturesque drive through the Hampshire countryside we finally met up with Phil and Jo who had already checked in and were enjoying an early evening drink sat in the sun. A quick freshen up and a well deserved drink we headed off to Rob's. After a convivial evening we returned to our accommodation for an early night. Up at 7 a.m. we breakfasted and Jo and Nina headed off to Beaulieu to be our reception crew. Rob picked Phil, Bradley and myself up to go to Thruxton. 509 was pulled from the hangar and filled to the brim with fuel. The .50 cals were fitted, ground wheels removed and strapped in and by 10 o'clock we were ready to depart. A phone call was made to warn Jo and Nina of our imminent take off, Phil and Rob strapped themselves in the front, Bradley walked the blades to the amidships position and released the tie down. All checks were made in the front and the starter button pressed. As the distinctive whine grew in volume the mighty rotors began to rotate and the aircraft began to take on its rocking motion, increasing in speed as the rotors came up to speed. After the final checks were made a call was put in to the tower for permission to lift. The green light was given and 509 rose in to the air hover taxiing to cross the centre line. After a couple of light aircraft had landed we were clear to go. Rob nosed her over and we were off moving into transitional lift and gaining altitude. From the DG wells the views were wonderful. It was a bright sunny morning and we set our course south to Beaulieu, the home of the National Motor Museum . After a 22 minute or so flight we were approaching the Show Ground. We made a pass getting our bearings and for Phil to decide which way he was going to approach the landing field. After flying over the site Phil made his turns to bring him in line for landing. Flaring gently, 509 was brought to the hover her powerful downwash whipping the freshly cut grass into a frenzy. She was then swung around with her nose in to wind and delicately settled down on the ground. 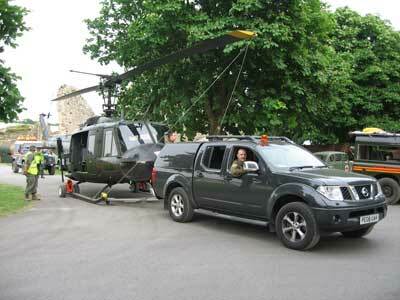 Once on the ground and the rotors secured, the ground wheels were attached and the Nissan hitched up. We proceeded at a snails pace over the field to make our way to the gravel path that led to our pitch. 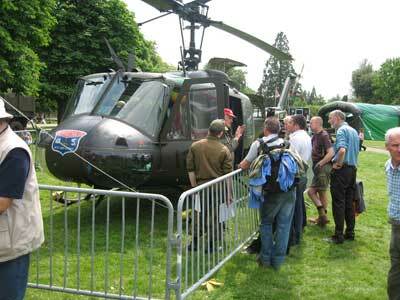 The towing of the Huey proved to be of great interest to the watching crowd. After being overtaken and left behind by electric buggies (!) we finally got 509 in position on the show field with some delicate manoeuvring. A safety fence was put around 509 and all the equipment put on display inside the aircraft. 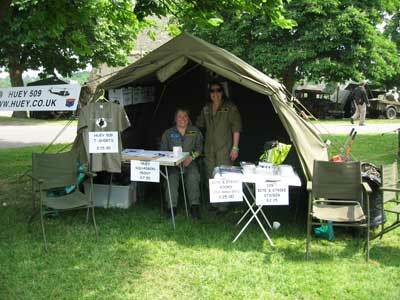 The day was warm and sunny and there was a constant stream of visitors for the rest of the day. We've no idea how many people we spoke to as Rob, Phil, Bradley, Jo, Nina and myself and the rest of the Team tried to answer all the questions asked of us. Showing our videos about the 129th Veterans visit and the recommissioning of 509 on a big screen TV proved to be very popular with the crowds. Come 3.30 p.m. we readied her once again to be towed out very slowly to the field. Rob and Phil climbed in the front of the Huey, Bradley and I in the back as the door gunners. We went through the start up procedure to lift around 4.30 p.m. After a couple of noisy circuits and buzzing Lord Montague's pad we headed north to fly to a friend of Rob's for a cuppa, ‘as you do'. After a half hour stop we headed back to Beaulieu for the night. Flying in we could see everyone on site looking up so we waved to everyone with everyone waving back. Once again we towed her back to the field to secure her for the night and having sorted everything out we headed to the village for something to eat. On our return we were warned of a storm that was heading our way. We got out the extra tie downs and made sure that the main and tail rotors would not damage themselves in the wind. Happy we had done all we could we retired for the night. The winds turned out not to be as strong as forecast but there was some heavy rain. Sunday we awoke to a very damp and overcast sky. Undeterred we sorted out 509 for whoever might come out on such a dismal day. A decision was made that with the forecast not being good that we wouldn't fly so we set up our generator and TV and other bits and pieces and chatted to those who had come across to see what we were doing. As the day progressed it got brighter and brighter and by the middle to late afternoon it was getting very hot. By this time it was too late for us to fly, much to the frustration of everyone, but we would make up for it. The day started slowly but the crowds grew and grew with all of us talking non stop. The final arena event was a display by the 'Rolling Thunder' Group who portray the troops of the Vietnam war and have the correct vintage vehicles. 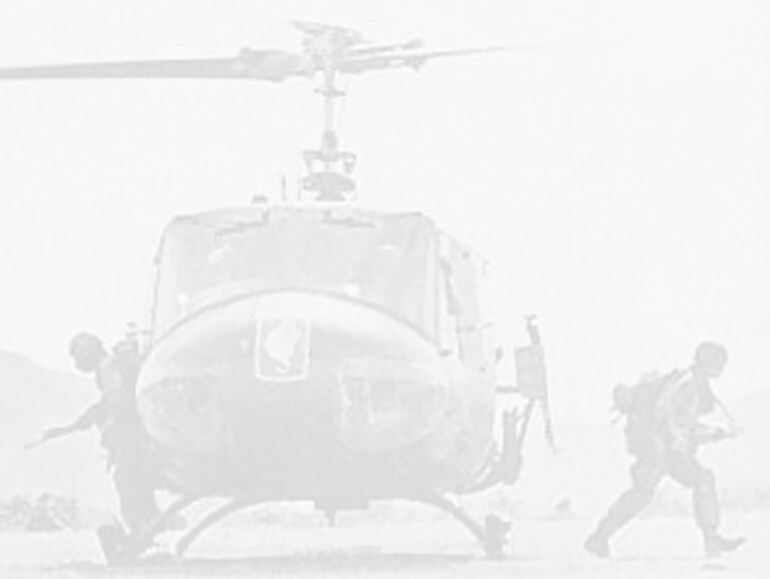 It was decided that some of the Airborne troops would give some assistance to the proceedings and jump from the Huey whilst the crew gave covering fire from the .50 cals. Lots of noise and smoke added to the spectacle - it was well and truly buzzing. That night there was a ' Vietnam ' era disco which went down a storm with everyone who attended. Sunday night/Monday morning the next weather front came in with torrential rain. We awoke to see the field looking more like a lake with water everywhere. The forecast did not look good with more bad weather coming from the south and heading north. The numbers coming through the gate were fairly low so we started to pack up the tents and the like and get them loaded as we were planning on 509 flying out at 3.30 p.m. The crowds that had grown throughout the morning lined the track and headed to the field to watch us take off. After strapping everything in Rob and Phil once again prepared to fly; 509 was going to do a couple of circuits with crew on board, come back to land to change over to those flying back north. Once the change over had been done 509 lifted once again, took a bow and headed off to come back for a final fly past thumping the sky in the only way she can. Unfortunately as the 509 crew headed to Thruxton the weather got worse and worse. It was clear they weren't going to flying back to Lancashire, so the motor home and the Navara diverted to the airfield to pick up the 4 that were stranded so they could travel north in the vehicles. Just after midnight everyone was at their respective homes ready for a good nights sleep. 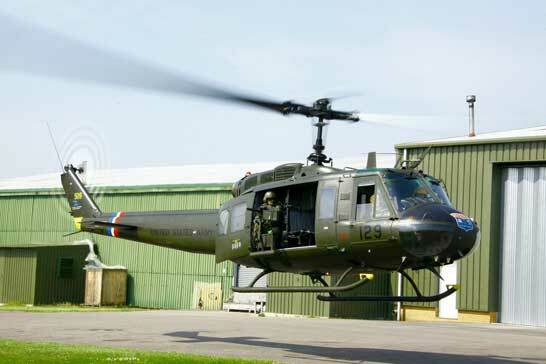 Rob flew Huey back home to the Fylde from Thruxton the next day and then drove back to his own home for a well earned rest! Trucks and Troops was a very enjoyable few days with hopefully many people going away happy to have seen the helicopter close up. Thanks to the Organisers and Show Hosts for a great event.